Solange has been a Healing Companion since establishment of the organization in 2003. Working as a HROC Assistant Coordinator in Kigali, she coordinated Kibuye Mediation Program sponsored by Friends Peace House from 2006to 2008. After being appointed as Co-Director in 2015 together with Hirwa JeanHubert and receiving bachelor’s degree in social work from Mt. 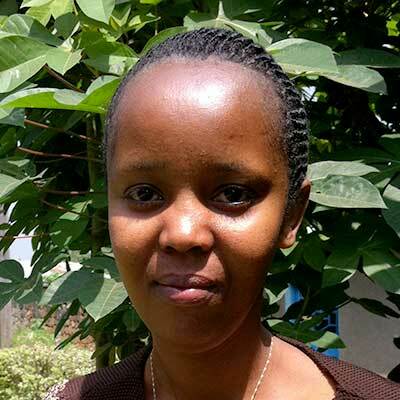 Kenya Universityin Kigali, she has been functioning as Administrative Coordinator in HROC Center located in Musanze, Rwanda. As well as these permanent program officers above, HROC Rwanda has seven well-trained International Facilitators helping various workshops and trainings nationwide, as well as here at HROCRwanda Center. Moreover, each of communities operating workshops has its community-based Healing Companions. HROC Rwanda also works closely with partners below.